Patient Freedom Act introduced but is it good enough? You are here: Home » Health Care » Repeal and Replace First Step; Not Far Enough? 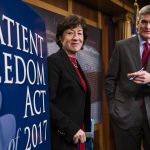 Two Republicans — Cassidy from LA and Collins from ME — introduced an Obama replacement plan. Collins said it is a starting point to get the conversation started. On the surface, not a bad start. But here is what it is missing. First, make all Americans self-pay patients. That is the only way to increase competition and reduce costs. It is a free-market principle. If we allow the American consumer make the choices individually, prices will drop. Right now, there is no free-market in healthcare. Think about it. A person has the freedom to get the healthcare he or she wanted at any time and any place of their choosing. Second, abolish the employer tax deduction for providing healthcare to employees. This well-meaning tax giveback causes more problems than solutions. In short, it doubles down on an anti-free market approach. This tax and its financial incentives to companies, studies show, has actually reduced jobs while lowering salaries. In addition, the tax deduction, along with the employer providing healthcare, removes any responsibility from the individual employee to pay attention to their healthcare and healthcare costs. “It’s not my money being spent; it’s the company’s.” Getting rid of the deduction would free up companies to concentrate on their core business not HR. And it would free up employees to work at a job for a reason other than healthcare. Third, allowing insurance companies to sell across state lines is worthless. First, it is almost impossible because the states control insurance regulations. And second, it doesn’t create more competition like freeing up consumers to dive into a market would. This brings real free market principles back. It is giving people – not government or a bureaucrat – the choice. Disclosure: I am a member and a spokesperson for Liberty HealthShare, which is medical cost sharing.